Experience three great Florida parks for the price of two - 3 parks, one great ticket, one low price! PLUS book today and Enjoy UNLIMITED FREE PARKING at all three parks! 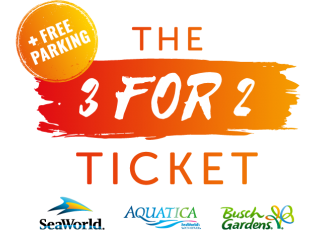 SeaWorld 3 for 2 Ticket with Unlimited FREE Parking enjoy admission to SeaWorld, Aquatica and Busch Gardens and pay less than 2 single day admission tickets! Tickets are activated the first time you visit any of the parks and you then have a two week window to visit the parks as many times as you like, ensuring your don't miss any of the awesome rides, shows and attractions. Welcome to Aquatica, a splashy watery park full of super-sized slides, speedy splashdowns and sandy shores. Take the plunge on Ihu’s Breakaway Falls which pits riders face-to-face waiting for the floor to drop. Rip through the tunnels and turns of Taumata Racer, the competitive mat race that’s staggeringly steep and deliriously head-first. Wanna-be skaters can take on Omaka Rocka’s™ half pipe tunnels, defying gravity as they climb the walls like a pro. Or why not take some time to relax? Simply drift along the soothing streams of Loggerhead Lane, unwind on a beautiful beach and let the waves wash over you. Come play side-by-side with the sea at Aquatica. You trek, you plunge, you chase, you spin.